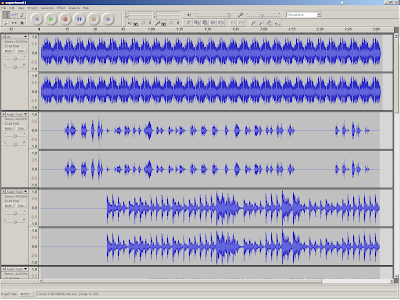 Here's a song I made using Audacity and a bunch of instruments: Experiment 1.
posted by Jonathan at 3/29/2008 09:09:00 p.m. I like this one. Where are the voices from? By Jeff Werner, at 4/03/2008 7:32 a.m.
Hi Jeff - Glad you like my humble attempt. The voice is me singing into my computer microphone. By Jonathan, at 4/03/2008 6:58 p.m.